Discussion in 'Axe, Tomahawk, & Hatchet Forum' started by ithinkverydeeply, Jan 14, 2019. I’ll humble brag for Blue Sasquatch, this is his. junkenstien, KiwiBloke, Yankee Josh and 2 others like this. I was watching that one as well. I stop looking near the end because the father it goes out of my reach the more depressed i get... Haha. I have several large roofs scheduled for the spring and a couple more during summer and i swear I'm gonna get me a damn nice axe. I don't care what it costs! Well i guess i care a little bit. Nbrackett, ithinkverydeeply and A17 like this. How is this for an astonishing auction! This price comes to (as of today) $378USD. I know right! What's the deal with those divots in the etching? Pretty inconvenient place to have them. I’ve seen just heads lately go for $70+.. This one made me want to cry after missing it. I really wanted it and should have/would have bid more for it. What was I thinking!.. A17 and Yankee Josh like this. Thanks bud! I have two of them actually, the other one is my keeper and this one is in the shop to sell. Those are tool marks, from someone using the axe in some manner over the last 100 years. 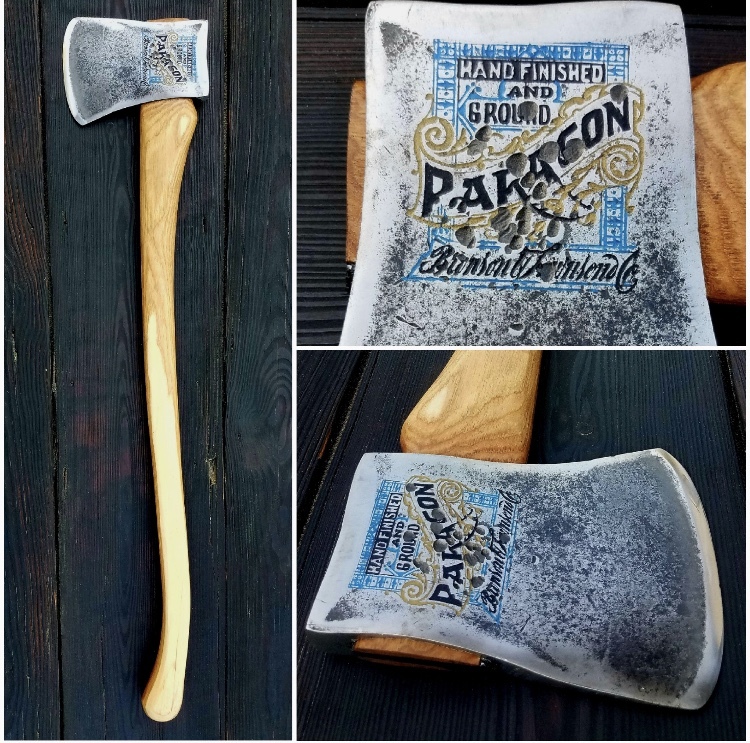 Axes were tools to be used, not hung on the wall back then, especially when you could walk in a store and buy one of these. I did my best to restore the head, but can't do much about that sort of damage. ithinkverydeeply and Nbrackett like this. Yeah 'used' not misused. Someone was careless and did not place much worth on this tool. 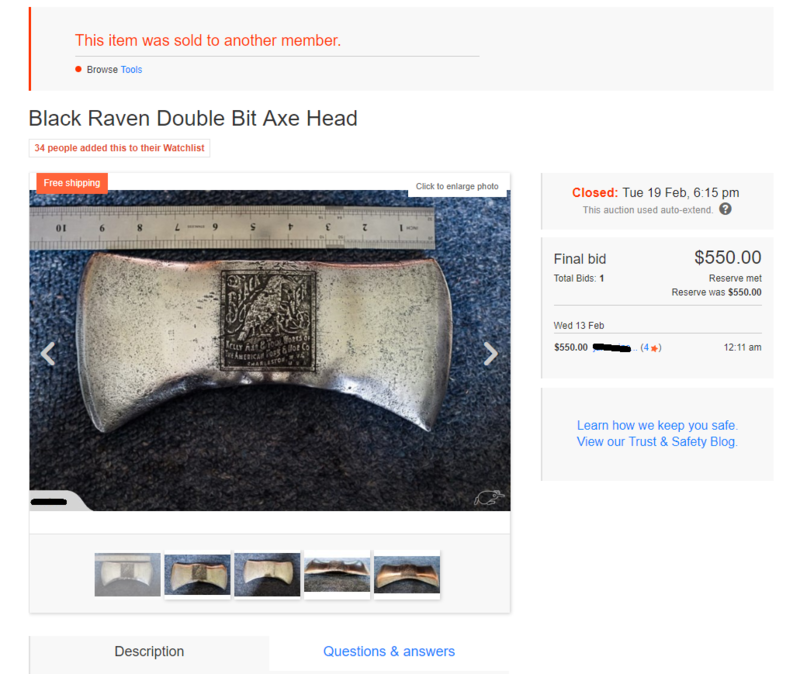 There's a Plumb axes listed for auction right now that is advertised as a 'Dreadnaught' but without any evidence that it is a dreadnaught. Let the buyer beware! phantomknives, ithinkverydeeply, Trailsawyer and 5 others like this. FOG2, A17 and quinton like this. There are not sufficient emoticons for this. Operator1975 or whatever the digits is, won that salesman axe. crbnSteeladdict, A17 and ithinkverydeeply like this. That guys collection must be worth an absolute fortune.. maybe not the most valuable collection in the world however I know there is an old fella in NZ with 30 Black Ravens. Don't know the condition though. DB_Cruiser, A17 and Yankee Josh like this. ithinkverydeeply, Yankee Josh and A17 like this. Yankee Josh, Square_peg and A17 like this. It's the condition and the marketing that adds value to an axe inferior to a Kelly Woodslasher. This might be the same one that was sold a couple years ago on the 'bay.